I shared these tips last year, but I wanted to share them again since they still apply! I am a fan of Cyber Monday and holiday online shopping in general, and I just have a few tips to share because Cyber Monday can also be overwhelming because there are so many deals and steals! 1. Have a rough idea of what people want. Write down everyone on your shopping list and jot down a few ideas that they may like & what your budget is for each person. When great deals pop-up, I sometimes forget who would be a great fit for what and may forget someone on my list momentarily. Also, I may have someone on my list that always wants something that never goes on sale (sound familiar? ), so Cyber Monday is a great day to cross those people off your list. This is because many stores will offer free shipping and a percentage discount on everything. You will just need to search for what you want specifically without it popping up on a deal finder. If you stay organized and know what people want sooner than later you can avoid doing a last minute splurge and paying full-price for something. 2. Know (and use!) the right resources. There are so, so many different online deal & money-saving websites that have list so many great Cyber Monday deals and use a combination of websites to find your favorites and best deals. These deal finders and resources can spark some great gift-giving ideas at rock bottom prices! There are also some deal sites that are especially dedicated to Cyber Monday that can help you out! Also, websites like Deal News lets you search for current and expired deals, so you can quickly find out if the deal is really a good deal, or the price listed is too high or goes on sale often. 3. Shop Early. Just like Black Friday some of the hottest deals will sell out quickly, so think about waking up a few minutes early to see if you can snag a great buy before work. Also, if you know what people want and what a good price is, and find a hot deal, make sure to snag it! Really great deals tend to go fast, so if you really want it, make sure it buy it quick! 4. Use Cashback Sites to save more. This is one of my favorite online shopping tips because you save even more money shopping online through Cashback sites. I love getting a percentage of what I buy online back later, which helps pay for future gifts! If you are unfamiliar with cashback sites, please read my former post here for more information! 5. Don’t buy it, if you won’t use it. It can be really easy to get caught up in a good deal, but if you or your gift-getter will not wear those deeply discounted New York Jets pajama pants for .79, then why are you even buying them? Know the return and shipping policies of each store before shopping, and take a second to breathe and think if it something you really will use or give to someone else to use. 6. Oh, and not everything is a great deal. Just like Black Friday, not everything on sale is a great deal. Do you research beforehand and know what is a great deal for a product you are interested in and what isn’t. For instance, typically the best time to buy jewelry is during the summer, the best time for toys is two weeks before Christmas and for TV’s is during the Super Bowl. However, just because those are typically the best times to buy those things doesn’t mean you still can’t find good deals, but be able to spot a good deal when you see. Also, just because a store offers free shipping and a percentage off, it may not make it a great deal, especially if the price is always cheaper at Walmart or Target who will price match. Do your research, know your audience, and don’t worry… deals always cycle back through if you get too overwhelmed, so if you missed something, a sale will most likely come back around again soon. 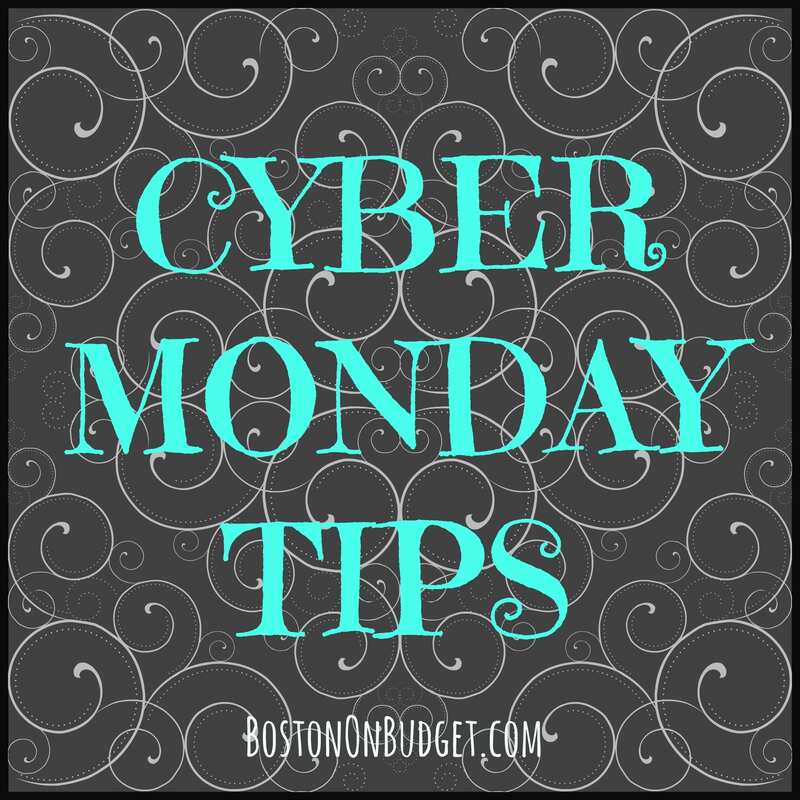 Do you have any Cyber Monday tips to share? Have you started your holiday shopping yet?! 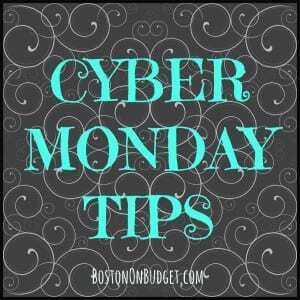 Also, check back on the blog tomorrow, Monday, December 2, 2013 for the best local and some national Cyber Monday deals! I won’t be going crazy with Cyber Monday deals, but I will highlight some great deals that apply to Boston in some way (or are just way to hot to pass up!) 🙂 Also, make sure you follow me on Twitter, because I like to post great deals that go fast just on there! Already got some great deals Friday and have some ideas for Monday’s shopping. Last year was the first year that we did 100% of our Christmas shopping online. We used the Pilewire and TabletBug websites. We bought mostly consumer electronics, but we got a lot of deals and got free shipping on many of the items. This year, we will use the FlatGadget website to pick up a couple of tablets and one TV. It’s the only way to go.